The following post should be considered for general education and should not be a substitute for medical advice from a doctor or other medical professional. Instead, use it as a tool for awareness. The following information was inspired by a course presented by Carleen Lindsey, PT, MS, CGS, CEEAA at the APTA Conference in Washington D.C. on January 23, 2019. Kyphosis is an abnormal exaggeration of the outward curvature of the thoracic spine that results in a rounded upper back, or “hunchback.” It often clinically presents in combination with forward head, protracted shoulder girdle, and dysfunctional lumbar alignment. What can therapy do to fix it? This is a whole body approach to correcting a common postural problem. 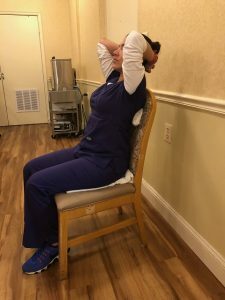 Once assessed by a doctor and therapist, it is the responsibility of the patient to make a commitment to perform these simple exercises every day and correct their posture using a mirror in standing and sitting. Continue to carry out the exercises and other strategies to correct posture, minimize pain, and improve the quality of movement.